Avaaz India is also part of an amazing 82 lakh-strong global community, which is winning battles everywhere for a better world — one free from corruption, oppression, and extreme poverty. You can feel it and see it — democracy is on the march in India. The Jan Lokpal bill must enter the parliament for a vote in this monsoon season. Until then, we’ll meet every challenge and block every dirty tactic to ensure we get the strong and effective anti-corruption law that all Indians want. 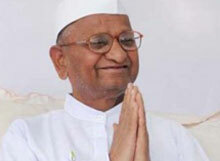 For a strong Lokpal: In just 36 hours 6,50,000 of us stood with Anna Hazare in calling for a strong Lokpal bill. By delivering our message directly to the Prime Minister and the media we helped built enough pressure to force the Government to agree to Hazare’s demands — and turned this into the most viral campaign in online campaigning history. Rapid-response action against the smear: We immediately reacted and fought the Government’s smear campaign of civil society calling on PM Singh to stop the slander. We were a lone voice holding the Government accountable for their dirty tricks and attempts to derail the anti-corruption movement, but days later the smear campaign vanished from the front pages of media — and we’ll be ready if it returns. Solidarity at India Gate: We joined a powerful citizen’s march on May Day culminating at India gate in Delhi where candles were lit in the formation of 6,57,371 — symbolizing the hope of thousands of Indian Avaaz members for a strong Lokpal. Direct high-level delivery of our message: Our call for a strong Lokpal was delivered directly to Lokpal drafting committee members, in front of the media, as they began their second meeting to work on the anti-corruption bill. Civil society and media called the second meeting cooperative and commented that finally the government was beginning to show its commitment to a strong anti-corruption bill. 6 ft Lokpal-cake: In a potent symbolic gesture of starting good deeds, we offered sweets to the Lokpal committee members. Avaaz members and children from the Salaam Balak Trust wearing khadi kurtas and Gandhi caps delivered a giant 6-foot cake with our numbers, that was then cut by Anna Hazare and other members of the drafting committee. Our message resonates at the heart of Delhi’s political life: We further intensified the people-powered pressure against corruption by posting a large billboard near parliament to hold the committee members accountable — it reads ’Either way, history will remember you’. And we will continue to post hard-hitting messages on the billboard all through next month. Many say India is a place that will only ever change slowly. This past month we’ve just scratched the surface of our true potential to bring about an even greater India — but already we’ve proven that great changes can happen in days. If our vision stays broad, our determination solid and our hope strong, there’s no telling what we can do in India, and in the world. Pascal, David and the entire Avaaz team.